how did you create the vertex snapping effect? Hey! I made a video on this a while back and it was a ton of fun! I'll admit, not much to do, but the art-style and the concept was rather interesting and really fun! The art style of this is so so cute !!! I love it ! I liked the gameplay, but there's not much progression - sure you can craft increasingly better equipment but to what end? I'd be nice if there were some cosmetic upgrades in which to spend your in-game money on. I've always wondered what it would be like to be a frog. Not necessarily a frog SMITH, but hey, there's firsts for everything! i can never get money at this game. idk why. do you know? i always make them in time and as you said i put the perfet temperature then hammer it, but i get 0 money. The game is beautiful in its simplicity. Heat the ingot to the first partial bar above the target tempurature. Ensure that your strike arrow lands in the target zone every time you strike. Stop striking the ingot if it reaches the first partial bar below the target tempurature. Repeat steps 1 and 2 until your progress bar is complete, then quench the ingot immediately to stop the heating process. A pretty good game actually! I had a lot of fun with it, but I'd like more options! Nice game, i'm curious about how the polygons of the model animated move like that, is like ps1, probably is something in Godot. Funny game. I don't know if I did something wrong, I couldn't have, but when I opened the game, it crashed and left me with a purple screen after the Cowthing logo. 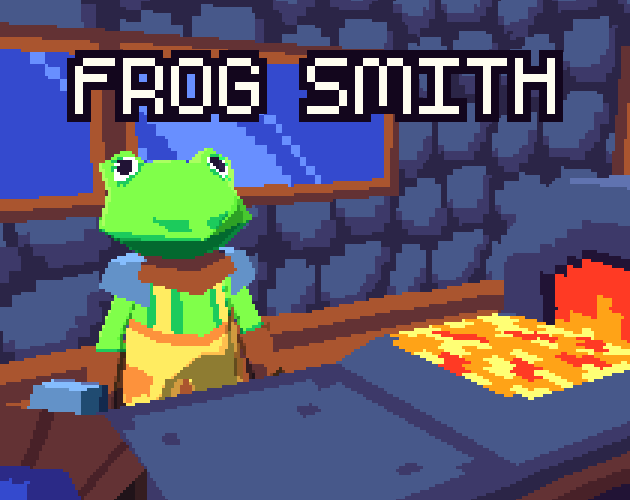 Frog Smith is an, awesome game. I would have liked a tutorial of how the process was suppose to go but, then again it's pretty obvious how to forge something. This game you can keep playing and, playing and lose track of time! and have consistently made masterpiece quality weapons afterwards. I think you made a fun and cute little game, would be interested in what you make in the future too! Played some of this on my channel! Really love the style here. Enjoyed the game for its graphics and premise, it definitely reminded me of Fantasy Life. I played it. It looks very refined for a game jam entry. Unfortunately it crashed when I wanted to put the read iron into the water bucket. About the lost source code: You are maybe able to recover it with some effort from the PCK file. The game concept is pretty sweet. However, I think there are somethings that need to be done to make this game better. There should be a how-to-play in-game. At the beginning of each session, the player should know what phase they are in the process of molding the weapon. When the user starts at the middle phase, it can seem like that's the first phase, when really one needs to heat the metal first before moving on. The solution to this one would be to distinguish the phases a little. I think, when molding the weapon in the middle phase, there should be some leeway when entering the middle and have some indicator on how close the player is to getting it perfect. Most games allow some leeway and if it's micrometers(just a guestimate) away from the middle, it considers it perfect. There should be an indicator of what is adding to the points and not adding to the points. That way the player can have some feel of what to improve. I haven't played the game too long, but I feel like the concept is awesome. However, it should be expanded to take full advantage of the idea. I think as more equipment is added, more phases needed to be added to the process i.e. with helmets, you have to make the straps, or even add a new phase to the process. I feel this game is good. However, it should be expanded upon and these things added/modified. Good work! it should give player excitement and "Flow" moment with slowly rising difficult curve..
like "its too cold - Add some heat" or "its too hot and soft"